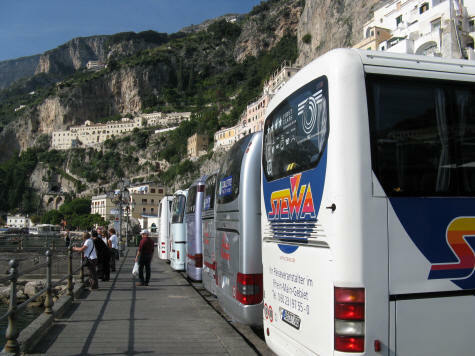 Frequent and inexpensive coach service is available along the Amalfi coast. Coaches travel between the Sorrento Circumvesuviana train station and the Salerno central train station with stops at Positano, Amalfi and other Amalfi Coast communities. To fully appreciate and enjoy the Amalfi coastline, tourists should consider traveling partially by coach and partially by ferry. An inexpensive way to see the Amalfi coastline is to purchase an unlimited single day bus pass at either Sorrento or Salerno and stop off at sites of interest (including Amalfi and Positano).